I saw a photo in the NY Times today of African immigrants who'd survived a Mediterranean crossing after being picked up by a humanitarian relief ship. The ship has been refused docking privileges in ports in Italy and Malta. No one wants these refugees from starvation, civil war, and tribal conflict. Shame on Europe. Shame on these amnesiacs who don't remember what German Nazis did to `undesirables' eighty years ago. 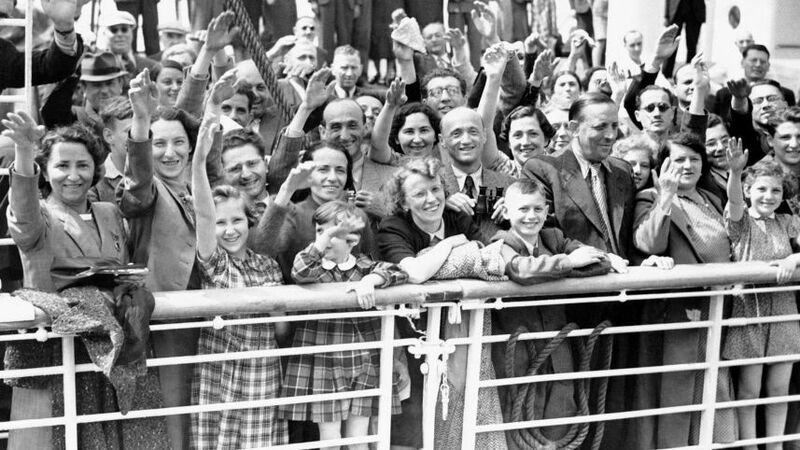 In 1939, a German ocean liner, the MS St. Louis, set sail from Hamburg with 937 German and European Jews aboard who sought refuge in the New World, away from the madness swamping Europe. The ship sailed for over a month without finding anyone who would take it. No Latin American countries would. It docked in Cuba in the hope of refuge. Appeals were made to U.S. government officials to help. Canada shut its doors too. All was in vain. No countries would open their borders or hearts. The refugees sailed back to Europe where 250 of them later died at the hands of the Nazis during the Holocaust. Thousands of African refugees are dying making the Mediterranean crossing. Hundreds of thousands are stranded in Europe, stateless and essentially homeless. Some countries like Germany have done more than their share. Others like Hungary and Poland are beset with rank nationalist fervor which sees foreigners are alien creatures who would pollute the national gene pool. Nor are Europeans the sole offenders here. We have a president who, despite taking an oath to defend the constitution, appears hell-bent on throwing it onto the trash heap. Not only has he tweeted that all immigrants arriving at our borders should be summarily denied entry and sent back wherever they came, in the process he's thrown due process and the rule of law, key pillars of our Constitution, to the wind. Today, a member of the Oregon national guard defaced a Facebook page raising money to reunite immigrant children torn from their parents by Trump's family separation policy. He wrote that they were lucky that we didn't execute them at the border. On May 13, 1939, the German transatlantic liner St. Louis sailed from Hamburg, Germany, for Havana, Cuba. On the voyage were 937 passengers. Almost all were Jews fleeing from the Third Reich. Most were German citizens, some were from eastern Europe, and a few were officially "stateless." Since the Kristallnacht (literally the "Night of Crystal," more commonly known as the "Night of Broken Glass") pogrom of November 9-10, 1938, the German government had sought to accelerate the pace of forced Jewish emigration. The German Foreign Office and the Propaganda Ministry also hoped to exploit the unwillingness of other nations to admit large numbers of Jewish refugees to justify the Nazi regime's anti-Jewish goals and policies both domestically in Germany and in the world at large. On 13 May 1939, more than 900 Jews fled Germany aboard a luxury cruise liner, the SS St Louis. They hoped to reach Cuba and then travel to the US - but were turned away in Havana and forced to return to Europe, where more than 250 were killed by the Nazis. "It was really something to be going on a luxury liner," says Gisela Feldman. "We didn't really know where we were heading, or how we would cope when we got there." At the age of 90, Feldman still clearly remembers the raw and mixed emotions she felt as a 15-year-old girl boarding the St Louis at Hamburg docks with her mother and younger sister. "I was always aware of how anxious my mother looked, embarking on such a long journey, on her own with two teenage daughters," she says. In the years following the rise to power of Hitler's Nazi party, ordinary Jewish families like Feldman's had been left in no doubt about the increasing dangers they were facing. Key words: Kristallnacht in Booman archives: 4 diaries. My recent diaries ... of course included an accusation of being an anti-Semite. Happened once before here @BooMan, some ten years ago. By MarekNYC I recall.